Israel’s Beer Sheva District Court on Tuesday sentenced 24-year-old Muhammad Abu Draz, an operative of Hamas’s Izzedine al-Qassam Brigades, to 15½ years in prison after convicting him of membership in a terrorist organization, conspiracy to commit an act of terror, attempted murder, several illegal arms offenses, and a series of national security offenses. 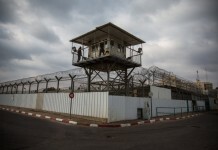 “The defendant’s actions are grave as they placed Israeli soldiers in serious danger. It was only thanks to the soldiers’ training that they were able to escape heavy loss of life over the defendant and his partners’ actions,” the court said in its ruling.